In spite of prevailing evidence, not all LED smart displays were made by Litronix and Hewlett-Packard. 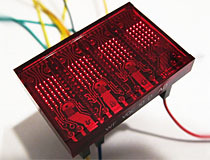 RFT, based in Germany, also made smart displays such as this one, the VQC10. 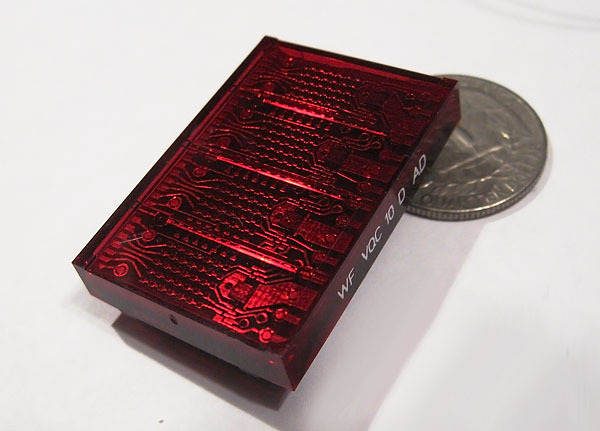 Packaged in an attractive red molded epoxy package, the VQC10 has four characters, each containing 35 LED dies arranged in a 5x7 matrix. Unlike many other smart displays, the VQC10 has no built in character driver or other advanced features. The display uses an extremely convoluted control scheme, rows across all digits are ganged together and controlled manually, while each column can be selected by sending a 9 bit address in parallel to the display's driver circuitry. The home experimenter should take note that the VQC10 has wider pin spacing than most DIP LED displays, and will not fit in a conventional breadboard or socket. RFT VQC 10 four digit smart display. The VQC10D is attractively packaged in shiny red epoxy, but has unusual pin spacing which makes it incompatible with most breadboards.